Japan Faces Another Recession As Company Spending Declines : The Two-Way The global slowdown is undermining the ambitious economic agenda known as "Abenomics." 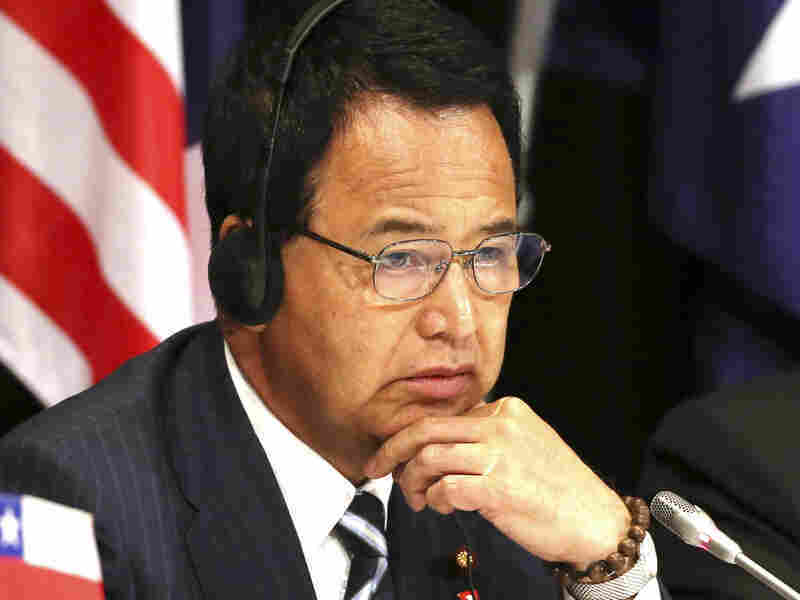 Japan's Economics Minister Akira Amari, shown here at a press conference in Australia last month, says despite the slowdown the economy will recover. Japan has once again slipped back into recession, casting new doubts upon whether "Abenomics," its much-touted economic-reform agenda, is succeeding. The economy contracted by .8 percent in the third quarter of 2015, following a decline of .7 percent in the preceding quarter. It was the fourth time in five years that the Japanese economy entered a recession, which is usually defined as two successive quarters of negative growth. The government said consumption by the private sector rose by .5 percent during the quarter, in line with expectations. But capital expenditures fell by 1.3 percent, in part because the slowdown in China is creating less demand for Japanese goods. At the same time Japanese companies produced less, leading to a major reduction in inventories, which cut 2.1 percent from total growth, The Wall Street Journal reported. "That could turn into a positive in coming months, though. When inventories are low, companies usually increase output, leading to faster growth in subsequent quarters." Harumi Taguchi, principal economist of IHS Global Insight, expects growth to return during the current quarter, as Japanese companies begin restocking their shelves. Japan has been battling slow growth and chronic deflation for years, and repeated efforts to reverse it have run aground. Under Japanese Prime Minister Shinzo Abe, the government has pursued a three-pronged policy aimed at restoring growth called "Abenomics." It has included monetary and fiscal stimulus but also economic reforms that have been tough to implement. "Without reform (the 'third arrow'), the economy's growth potential remains low, making it vulnerable to shocks and to suffering recessions more often,"
said Economics Minister Akira Amari at a press conference today. Amari also dismissed the idea of greater stimulus spending, an idea proposed by U.S. Treasury Secretary Jacob Lew, noting that a lack of workers made large public-works projects difficult. Many Japanese companies have record cash holdings and should use it to raise wages and boost capital spending, Amari said. Despite the disappointing numbers, Amari expressed some optimism that Japan can reverse its decline in growth. "While there are risks such as overseas developments, we expect the economy to head toward a moderate recovery thanks to the effect of the various (stimulus) steps taken so far," Amari said in a statement.